The expo hall entrance, which was the main inlet to the massive show floor for all the weekend’s attendees. Thousands streamed through under this arch every day to see new games and panels. The crowds line up at the Penny Arcade merch booth to get shirts, mugs and the almighty pins that would be a trading commodity for the next few days. Cosplayers were out in full force, including this portrayal of Sans from Undertale, who was one of the first in line for the day. Six Foot’s Dreadnought had a massive booth. Players who visited multiple times throughout the convention got an invite to a special party on Saturday night, and got tokens they could trade in for shirts. Alienware had a “game truck” on site, which was basically a giant mobile game center filled with PCs and subwoofers. Maybe not the most practical vehicle, but certainly impressive. Virtual reality was on display at several booths, including AMD’s, where they showcased the consumer version of the Rift. Players could experience titles like EVE Valkyrie and Edge of Nowhere on the official Oculus hardware. Attendees stream in through the expo hall entrance, illuminated by the many giant screens from nearby booths. Every morning, people were lined up hours early to be the first to get in and get in line for the more popular booths. A classic arcade room offered free play on a variety of machines, which made for a nice getaway from the loud expo hall floor. Attendees often escaped up here for a quick match on different arcade cabinets, like the pictured NBA Jam. The Diversity Lounge offered bean bags and respite from the crowds, while also spotlighting the different interest groups like Houston Gaymers and the Take This Organization. Crowds formed around every booth, especially the merch stores. The Valve Store, shown below the giant pink unicorn balloon, had a variety of merchandise from the company’s popular games, including Dota 2 and Portal. Fallout was a popular series for cosplayers this year. This Vault Dweller made her own jumpsuit and equipment, and even had the Pip-Boy app running in her arm-band companion. The developers of The Jackbox Party Pack set up in a hall, next to the queue lines for many popular panels. Many of those waiting in line for panels killed time and had some laughs playing games like Quiplash and Drawful with complete strangers. The detail in cosplay was very impressive. This Wario cosplayer had a mustache, colored overalls, mustache and a very convincing Wario laugh. The Twitch booth is a staple at any convention nowadays, and PAX South was no different. Streamers, demos and interviews took place throughout the show floor hours as viewers could watch both in-person and at home. The best cosplays aren’t always the most detailed. This glowing crystal, an homage to The Sims, was a surprisingly effective method of simple cosplay. Reaper Miniatures offered attendees the chance to paint their own miniature for free, with a variety of prefab figures and paints available. Even if you don’t play tabletop games, having a cool little figure you painted is a nice souvenir. Hardware vendors were eager to showcase their newest pieces of tech, like this extravagant case from Kingston. Using an app on a smartphone, the case could open and close to reveal the inside. Many publishers had a larger play area set up alongside demo stations, like this LED wall at the Devolver Digital booth. Players could sit on a couch and run co-op Enter the Gungeon runs on this beautiful screen throughout the day. The multiplayer games on the show floor often had a crowd gathered around those playing. The pumping tunes of Just Shapes and Beats often drew a good number of people over to watch, especially if the players were on the Mortal Kombat stage. Even on day three, developers were eager to showcase their product. This group, the makers of a party game called God Hates Charades, pulled in giant crowds with their impromptu sessions. A couple dressed as the Medic from Team Fortress 2 and Chell from Portal. Couples who cosplayed together often had a theme, which was both adorable and sickening for those of us alone at the convention. This Inkling Girl cosplay shows no one is too young to cosplay. The massive ink roller was really impressive to see in person, especially because it looked bigger than the girl carrying it. An electrical engineer fixes a loose joystick on a Mortal Kombat machine in the arcade. Even in a day and age of digital distribution and home consoles, people gathered around to watch him tweak boards and circuits, amazed at the process they were seeing unfold. Some developers found new innovations for their title on the show floor. The developers of Western Press, a quick-time event multiplayer title, figured out that using a dance pad instead of a controller made for a surprisingly fun twist on their game. Panels like this one, for the upcoming XCOM 2, drew massive crowds and lines. As those in the industry discussed all kinds of topics, crowds listened in and absorbed all the info they could. Fandom knows no limits, as cosplayers often stayed in costume despite the number of people crammed into the panel rooms. This particular cosplayer, wearing what looked like XCOM armor, was particularly enthralled throughout the panel. Besides the Oculus, developer versions of the HTC Vive virtual reality headset were on display at several booths. In this particular demo for Marble Mountain, players had to roll a marble across a variety of puzzles and tunnels, all through an omniscient VR view. In the tabletop showcase area, game creators had a chance to show off their passion projects to prospective backers and buyers. This particular game, Burgle Bros., was like a tabletop version of Invisible, Inc., where players tried to pull of heists and get out without being caught by guards. Though many aspects of games were finished, sometimes developers had to improvise. The creators of Burgle Bros. utilized Hershey’s candy for their gold tokens during gameplay demos. A row of fight sticks signifies the Capcom booth, where lines of players waited to try their hand at Street Fighter V. Some performed admirably, and some (like yours truly) fell to their own hubris. I still say my stick was defective. MAGFest hosted a jam space, where throughout the weekend several artists performed, with con-goers filling in the gaps with impromptu covers on the house instruments. Here, two nerdcore rappers go back and forth on a cypher to end a show. The PAX Rising area hosted many new games that captivated young and old alike. Here, a young attendee takes on three others on a round of Invisigun Heroes. Spoilers: He did pretty well. Two attendees look over the wall of shirts at the We Love Fine booth. Apparel for everything from Steven Universe and Borderlands to Hatsune Miku was available for purchase on-site. It was hard to escape e-sports in the expo hall, as massive tournaments and booming shoutcasters often dominated the larger booths. Here, players compete in a laddered tournament for the game Grey Goo. Three shoutcasters go over the post-game of a Hearthstone match in the Twitch booth. Players from different universities around the nation had travelled to San Antonio to compete in the College Championships for the grand prize of scholarship money. The PAX Arena played host to many competitions throughout the weekend, though the common game was often Super Smash Bros. Melee. Players are shown here competing on CRT monitors, a facet of competitive Melee. Insomniac Games had a small booth for con-goers to sit and watch painters practice their art, as they crafted a beautiful mural for the upcoming Song of the Deep. Starting from a blank canvas, the team had all but filled the mural with luscious brush strokes by the end of the weekend. This past weekend, many people traveled down to the Lone Star State for the second annual PAX South in San Antonio. The event was host to massive booths, panels, events and developers, showcasing some of the great things to come in 2016 for videogames. From the PAX Rising area to the giant screens, from jam spaces and arcades to tabletop freeplay sections, we took in all the sights and sounds of PAX South and brought them to you here, in discrete gallery form. 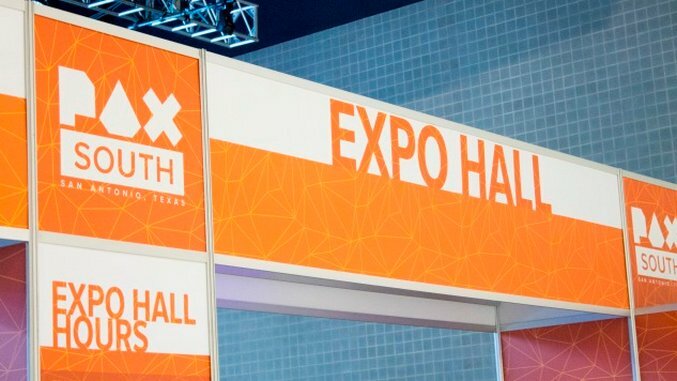 Enjoy our picture tour of PAX South!